HIGH QUALITY: These bottle coolers are made of durable, reliable, and dependable neoprene which is the same material wet-suits are made of. We have spent many weekends testing them for functionality and durability, and we can say "They last" with confidence. The precision sewing provides an excellent stitch to hold everything together. VETERANS: Portion of the profit go to our veterans!!!! Support our troops, country, freedom and democracy while keeping your drink cold and hand dry!! GREAT FOR EVENTS AND GIFTING: Camping, BBQs, Birthday Parties, Gifts,Tailgating, Bon Fires, Family Reunions & Picnics, Bachelor and Bachelorette Parties, Bridal Showers, Block Parties, Dance Parties and Mixers, Graduation Parties, Retirement Parties, Gag Gifts, Novelty Gifts, Mother's Day, Father's Day, Housewarming Gift, Hostess Gift and Family Gatherings. 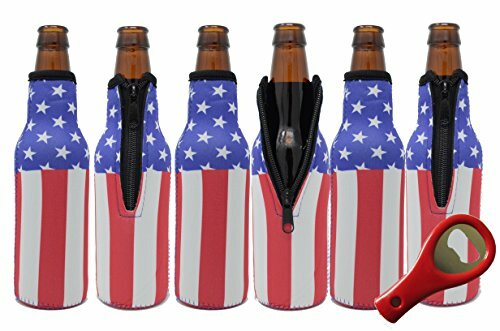 Perfect insulator sleeve for camping, BBQ, 4th of July, Memorial Day, fishing, pool side hang outs, parties, concerts, Olympic sledding events & more because they're bulk beer bottle sleeves. Your beer will stay cold, delicious and refreshing. If you have any questions about this product by Glubey, contact us by completing and submitting the form below. If you are looking for a specif part number, please include it with your message.